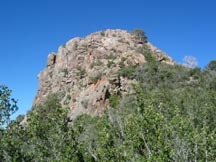 Thumb Butte, Prescott’s distinctive landmark, is only two miles from my summer refuge. The Yavapai people called it “Nymit-gi-yaka” for “Mountain Lion Lying Down.” The Prescott Yavapai tribe, now said to number about 133 individuals, have a reservation of 1,400 acres located centrally in Prescott. The Thumb Butte Loop Trail (TR33) is a 1.9 mile trail that starts across the road from the parking area ($2 day use fee, free on Wednesdays). By traveling counter clockwise the grade is a steady 9% to just below its 6,514 foot craggy crest. The Groom Creek Vista spur at the summit offers a spectacular overview of the Prescott area. The steeper (12-18% grade) eastern portion of the trail is paved. Signs along the trail identify vegetation such as the unusual bark of the aptly named alligator juniper and special features such as an abandoned mine. There are many other trails in this area. Thus far we have explored TR 315 (0.8 miles one way) which goes near a water tower, TR 317 (1.0 miles one way) that ends in a residential area, and part of TR 316 (1.5 miles one way) that returned us to the parking lot. The deep blue sky of this area accentuates the experience of high mountain hiking, an opportunity to contemplate the interconnections and interdependence of this area’s people, plants, and animal communities. For good reason more than three million annual tourists are attracted to this unique geological area that features rugged red rock buttes and pinnacles. We joined many other visitors this past Sunday. On our way to our first stop at Red Rock Crossing, we passed the appropriately named Red Rock High School. Be prepared to pay $8 to enter the Coconino National Forest. It is impossible, however, to put a price on the views of Cathedral Rock. Sedona is said to contain a curiously high number of vortexes and is one of the few places in the world that possesses all three types of energy (electrical, magnetic, and electromagnetic). One of the vortexes is said to be in the area north of Cathedral Rock. Art galleries and restaurants intermingle with specialty shops in Tlaquepaque, a shopping village modeled after a small Mexican village. Stone chairs (with anything but rock bottom prices) and wind sculptures were captivating. For lunch try the Oak Creek Brewery and Grill for terrific food and views of Snoopy Rock. Next visit I’ll try the “seven dwarfs” in order to sample their seven beers in five ounce steins. Another inspiring stop was at the Chapel of the Holy Cross, a contemporary Catholic shrine that stands on a small mountain with limited parking. Built in 1956, the chapel offers dramatic scenic views of the area’s red rock. 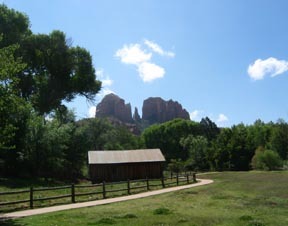 Sedona is an inspiring place that refreshes and renews. At the end of two long days of driving, a stop in Sante Fe introduced me to the Southwest. Soon after exiting I40, mountains became visible while driving north on highway 285. After almost an hour of driving, the first homes became visible on the outskirts of town. Colored in shades of brown, dwellings blend in with the landscape. The Pueblo look is appealing and distinctive in private and commercial buildings. The Plaza continues to be a vibrant center of this capital city which has seen four flags (Spanish, Mexican, Confederate, and U.S.) in the past four centuries. Native artisans display their items for sale on the sidewalk. Shops sell both traditional and modern art forms. Even a hat band can be a piece of art (with a $325 price tag). The nearby Cathedral Basilica of St. Francis of Assisi is picture postcard worthy. 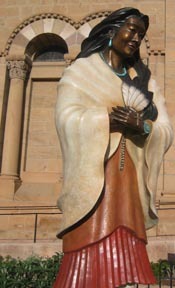 “Blessed Kateri Tekakwitha” by Estella Loretto captured my attention with its message of “Kindness, Forgiveness, Love, Compassion, and Joyful Peace.” Who knew that the city also has a National Cemetery? Space awaits veterans of past and current wars. On another note, the Santa Fe Opera, seven miles out of town, is celebrated with its open-air theater against the backdrop of the Sangre de Cristo Mountains. A glorious desert sunset completed a short but enchanting visit. Upon entering the Ohio Theatre we were greeted by members of the Columbus Symphony Orchestra such as Luis Biava, the principal cellist. Having the opportunity to greet the musicians made this last concert in the classical series special. The performance of Beethoven’s Overture to Egmont, Op. 84 imaginatively invoked a sense of inner anxiety. Anton Kuerti, the featured soloist in Schumann’s Concerto in A Minor for Piano and Orchestra, Op. 54, displayed a mature assurance. Alas, despite rousing applause from the packed theatre, no encore was forthcoming. Unless, of course, we consider the closing Mendelssohn’s Symphony No. 3 in A Minor, Op. 56 a melancholy end not only to this season, but perhaps for the foreseeable future. The Columbus Dispatch has reported that without the support of a not so anonymous donor the Symphony would not have been able to play during the month of May. There are no plans in place for music this summer or next year. It’s a sad time for Columbus music lovers. 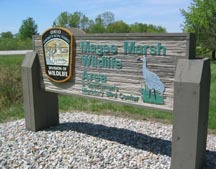 Magee Marsh was the place to be this past Saturday to participate in the sixteenth annual International Migratory Bird Day. Although there weren’t many varieties of warblers, we did see some interesting birds. An American woodcock was stationary on the wooded forest floor. Baltimore orioles with their bright orange breasts were easy to spot in the canopy of leaves. An Eastern screech owl was camouflaged against gray bark. The boardwalk provided an opportunity for people watching, too. In addition to the many dedicated birders wearing pocketed vests and binoculars around their necks, Amish numbered almost half of the visitors.